Payton Mount was the T-Birds first round selection, 19th overall, in the 2017 WHL Bantam Draft. Mount recently won a gold medal with Team BC at the 2017 WHL Cup. He took part in T-Birds training camp this fall and played two preseason games and had one goal. Mount took some time out of his busy schedule to talk about his winning a gold medal, his training camp experience and how his season with Delta Hockey Academy Prep in the CSSHL is going. 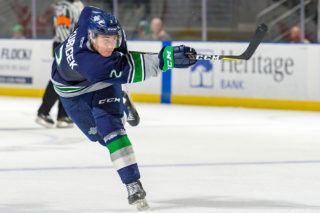 Seattle Thunderbirds: Payton, thanks for taking some time to chat. How does it feel to have won a gold medal with Team BC at the WHL Cup? Payton Mount: It is an amazing feeling to win the WHL cup. We battled hard together as a team through the whole tournament. After an 0-2 start, we stuck with the team process and were able to win the next two games which gave us more confidence to help us get to the finals and I think we played a great game against Alberta in the finals. Winning the final gold medal game will be a lifelong memory for my teammates and myself. ST: What were your thoughts going into overtime of the gold medal game tied 3-3 with Team Alberta? PM: My thoughts in going into overtime was that we needed to work hard, give lots of pressure and that it only takes one shot to win this tournament. I was going to do everything I could for my teammates to bring this one back to BC! ST: What was the whole WHL Cup tournament experience like? PM: It was an amazing experience playing against all the best kids in Western Canada. I have made some lifelong hockey brothers. This tournament was a first-class tournament and I just want to say thank you for this opportunity to play for Team BC and thank you to those that that put this tournament on. Thank you to all staff members and coaches and most of all, my teammates. ST: Your Team BC I am guessing was a group of guys you might that hadn’t played much together prior to the tournament. What did the team do to develop chemistry and bond at the tournament? PM: There were lots of team bonding events to help the guys get to know each other. We spent most of the week all together hanging out, eating, and practicing so we could learn about each other. Our players tried to get to know each other at a very personal level to help build very good team chemistry. I am lucky to have played with most of these guys before this tournament. 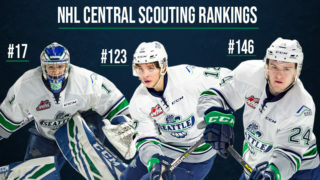 ST: You were playing against teams in the tournament that have numerous WHL Prospects. What did you think of the level of play at the tournament? PM: The level of play was very high because of the high-end skill level of all players. I am familiar with many of the players on all the teams and I knew it would mean tough games from start to finish. ST: What are you able to take from the tournament experience and apply to your game? PM: Playing on a big ice surface meant that speed was a very useful tool because there is a lot of room to skate out there. My game is a fast-paced game and it reinforced that speed is a very good thing to help in all areas of my game. ST: Prior to the WHL Cup, how has your season with the Delta Hockey Academy Prep team been going? PM: I have had a really good start to the season at Delta. I think I have adapted my game to use my speed but have been more physical with some of the older, bigger players. I have been lucky to have great teammates that move the puck and we have had very good results. ST: Do you have any team or personal goals with Delta this season? PM: My personal goal is the same as my team goal. I want our team to win the CSSHL U18 Prep league and playoffs. 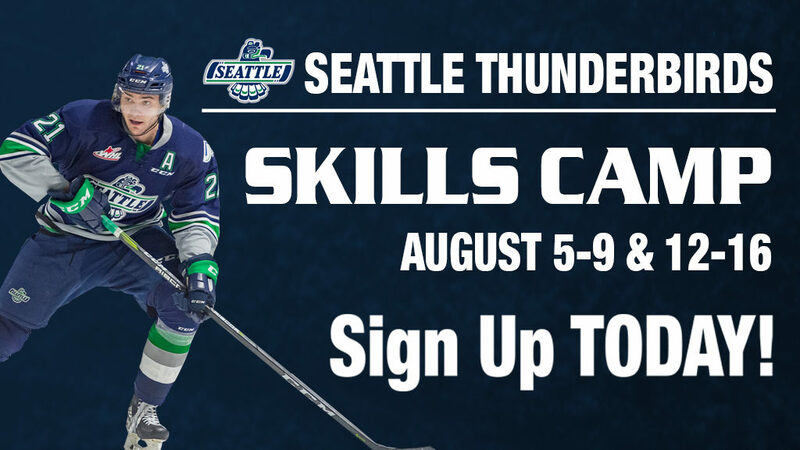 ST: How did T-Birds Training Camp go for you back in August? PM: I hope that I made a very good impression on the coaches and fellow players as being someone that they think can really help the team in the future. I learned from the vets and tried to observe what they do to help the team win. I was lucky to play two preseason game with the T-Birds and I know things that I can improve on. ST: You scored in the T-Birds first preseason game against Vancouver. What do you remember about that goal? PM: I remember getting the puck in the neutral zone early in my shift on the powerplay. I was going behind our net and the guy started chasing me and as I came around the net I was thinking 5 on 3 now. I saw some open ice and skated towards it. I made a move on the d-man and got around him and looked over and I was alone on the goalie. I used my speed to stretch the goalie out and tucked it in on the far side. I remember my teammates on the ice coming over to congratulate me. ST: All players at Training Camp had shirts that had “Embrace The Culture” on the back. What did that mean to you? PM: To me “Embrace the Culture” meant to take in everything you experience and embrace the systems given and use it to become a better team player. 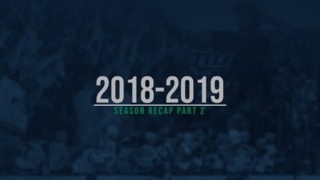 ST: With all that you have going on, how closely are you following the T-Birds this season? PM: I have been following Seattle closely. I check in after every game and get the box score to see how the boys are doing and who is up next to play. ST: We heard that your family had season tickets to the Victoria Royals. But that ended once you were drafted the by T-Birds. Is this a true story? PM: My parents were going to buy season tickets as my little bro likes to go to WHL games as do I. I Iive with my billet family outside of Victoria and my parents thought they would wait on Royals tickets in case they have to travel to see me in other cities playing with Delta or even maybe Seattle one day. ST: Thanks for your time Payton. All the best with Delta this season and maybe we will see you later on in our season. PM: Thank you for reaching out to me about my experience at the WHL cup. I will always remember that experience, but I am very excited to see what might develop for me in Seattle in the near future. I would love to see game play in Seattle soon. Seattle Thunderbirds Public & Media Relations Director Ian Henry conducted the Q&A Payton Mount.